NPD Solarbuzz, a market research firm specializing in solar energy, has just released a new report, the Module Tracker Quarterly for the second quarter (Q2) of 2013. 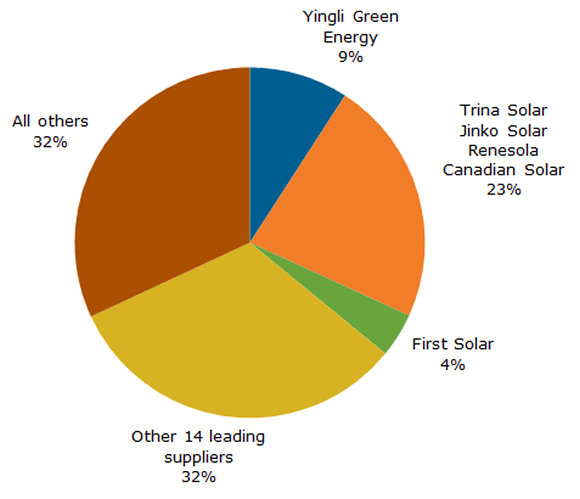 The report shows that 21% more solar modules were shipped in Q2 2013 than in Q2 2012 by the top 20 solar module providers. These top solar module suppliers shipped a record number of solar modules with a total power generation capacity of 5.8 gigawatts (GW). For those who don’t follow the power industry closely, 5.8 gigawatts is equal to 5.8 billion watts. That’s enough power to power 58 million 100-watt light bulbs. Of course, there’s a reason a record number of solar modules with so much power capacity left the factories of Chinese, American, German, Japanese, South Korean, and other factories. Solar power has hit the prime time. It’s been drafted. It’s in the game. But it’s only going to get better. This record will likely be broken within the next year. Within a few years, it will look like a small amount. The fact is, solar panel costs have dropped tremendously, and going solar has become cheaper than buying electricity from the grid for tens of millions or even hundreds of millions of homes. The main thing keeping many of these families from going solar is simply the fact that they don’t realize they can save so much money. Don’t miss out on the opportunity to save tens of thousands of dollars. Join the solar revolution today!